Matomo Web Analytics Essentials is probably the most accurate title one could give a book of this nature. What made this book a joy to read was author Stephan A. Miller’s technical yet conversational style. It was a very rewarding read, especially considering Analytics can be a topic that can easily become dry and mind-numbing. I can honestly say it was one of the more enjoyable analytics books I have read in a long time. What I appreciate most is Stephan does a good job balancing the technical information for the webmaster/blogger/small business user, but he also does not shy away from giving developers the info they need. There is plenty for the curious who want to learn, without getting lost in jargon. In short, for those that want to install, implement, optimize or even customize their Matomo (Piwik) implementation, this book will definitely be something you’ll want to keep nearby. So what does the book cover exactly? Chapter 1: Installation and Setup: In this chapter you learn how to get started, from downloading to installation. It also includes important information regarding backing-up your installation, security considerations and optimizing for high traffic. Chapter 2: Using Matomo’s Interface and Reports: In the chapter you learn how to navigate the system, set up dashboards, as well as find the information you want and need. Stephan goes into detail of each tab explaining the widgets and reports, including how to set up email reports. Chapter 4: Setting Up and Tracking Goals: Now that you are tracking Stephan covers how to measure success with goals. This includes information about tracking conversions so you can measure the success of your website objectives. Chapter 5: Tracking Marketing Campaigns: In this chapter you will learn about campaign tracking including social media and tracking PPC campaigns from Google, Yahoo! and Microsoft. Stephan explains how to tag your urls and customize campaign parameters. Chapter 6: Tracking Events: Learn how to use Matomo’s custom variables in very powerful ways for content sharing and ecommerce. Chapter 7: E-commerce Tracking: All you need to know about how to track orders from start to finish. Chapter 8: Matomo (Piwik) Website and User Administration: Overview of how the backend of Matomo works when it comes to users and website administration. Chapter 9: Advanced Tracking and Development: Learn more about using the image tracker, the PHP tracking API, Java, Python and other languages Matomo (Piwik) can be used in. In this chapter, Stephan also covers debugging tracking code and the basics of building plugins. Chapter 10: Matomo (Piwik) Integration: This chapter explores how to get data from Matomo so you can integrate it with other applications. Stephan also highlights popular integrations including WordPress, and the Mobile IOS and Android Apps that have been built by the community. Appendix A & B: These cover the Tracking API Reference and the Analytics API Reference. Very handy for development work. As you can see this is a very comprehensive book with something for everyone. It will definitely be a book I keep handy when working with Matomo in the future, and will surely be a solid reference for anyone who wants to get the most from their Matomo server. Where/how do I get the book? 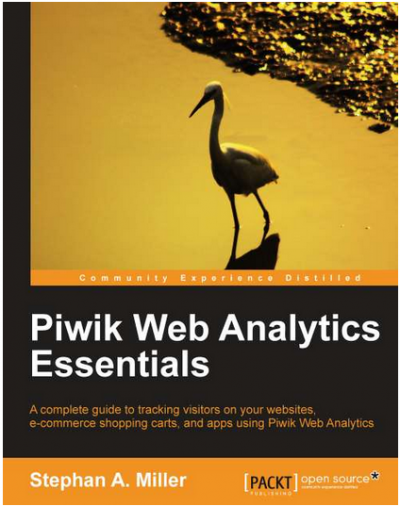 The book is available to buy right now at a http://www.packtpub.com/piwik-web-analytics-essentials/book. You can also order from Amazon.